About a third of the way through her set on Friday night, Gabriela Quintero explained her pact with the Uptown Theater crowd. She and Rodrigo Sanchez promised to play only acoustic guitars if the audience let the pair play whatever they wanted. The audience in the crowded theater responded enthusiastically to almost everything thrown at it in the 100-minute set. The rapt attention the acoustic instrumental music commanded spoke to the pair’s skill and ingenuity. The music was a mixture of Mexican, Irish, African, metal and folk, leading to another of Quintero’s maxims: They don’t label their music because then they’d be trapped playing to that label. With no classification, they can — and do — play anything. 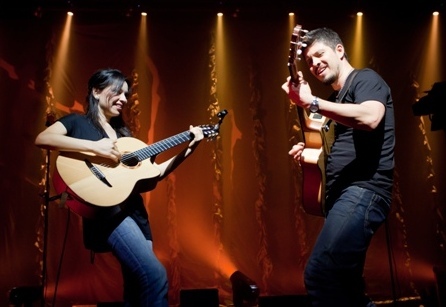 Rodrigo y Gabriela started performing together in their native Mexico in the late ’90s. By the new millennium, the pair had relocated to Dublin and caught the eye of Damien Rice and David Gray. Their first album came out in 2002. In the dozen years since, they have released an album almost yearly, alternating studio material with live albums. Friday’s performance touched on many of those albums and also previewed material slated for release next year. With no new album since 2012’s “Area 52,” Sanchez admitted there wasn’t really a reason for the duo to be touring. They just wanted to play. While both guitarists are virtuosos, Quintero displayed an especially strong right hand. Viciously strumming without a pick, she summoned a plethora of textures and rhythms. Often treating her guitar like a percussive instrument, she was easily able to generate as much kick as a bass drum. Quintero’s skill with a wah pedal also added to her arsenal. Against this backdrop, Sanchez showed amazing dexterity with his left hand, lacing songs with intricate riffs and solos. Sanchez also wasn’t shy about showing off his metal roots. He tossed Metallica riffs between songs a few times, and threw in some Megadeth for good measure. A full cover of Metallica’s “Orion” showed why the pair have earned the respect of their metal heroes. A right-turn cover of Daft Punk’s “Get Lucky” generated the biggest applause of the night. The sound was immaculate. Both instruments were close mic’d, adding the squeak of fingers on the fretboards and sound of Sanchez’s pick hitting the strings to the mix. When inattentive fans started talking, the rest of the audience had no qualms about shutting them up. Although their songs have no words, Sanchez and Quintero had no trouble keeping the crowd involved. At one point Sanchez had a three-part clap circulating around the theater. The two’s infectious energy — Quintero relished jumping around the stage — kept fans on their feet for most of the last half of the set. 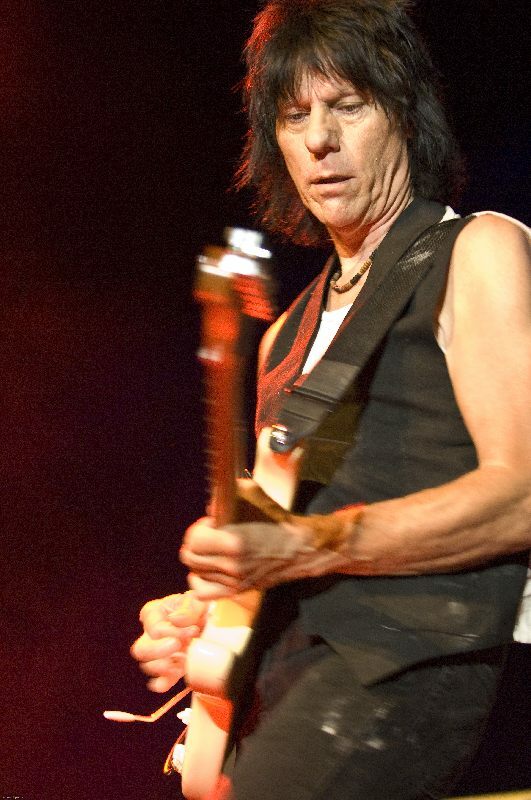 After staying away from Kansas City for more than a decade, guitar wizard Jeff Beck has graced city limits twice in a year. The setlist for Saturday night’s concert at a sold-out Uptown Theater may have resembled his y concert at Starlight in APril 2010, but if anyone had a problem with the encore performance they did a good job of hiding it. Beck had been touring with a pair of vocalists and a horn section and playing 1950s rockabilly and rock and roll classics, so it was somewhat disappointing to see him take the stage with his standard touring band. Any misgivings were easily brushed aside before the first chorus, however. The musical structure of all pop songs is repetitive – verse, chorus, verse, bridge. Clever lyrics are a major reason why many songs stay fresh. As an instrumentalist, Beck turned to different tools to keep his music interesting. The guitarist and his backing trio, which included Jason Robello on keyboards, Rhonda Smith on bass and drummer Narada Michael Walden, worked hard to make sure the energy never flagged. The hour-and-45-minute set shifted smoothly between all-out rockers like “Big Block” and delicate readings of “Corpus Christi Carol” and “Two Rivers.” When the quartet opened up the throttle they created a powerful sound. The rhythm section of Walden and Smith played off each other with a notesy, complementary competition in the vein of Keith Moon and John Entwistle. Robello subtly filled in the remaining colors. Shunning the microphone set up at extreme stage right for most of the night, Beck did all of his communicating with his hands and arms. A flick of the wrist indicated the tempo, while an outstretched arm highlighted the soloist. By shooting his arm straight up, Beck induced a nifty call-and-response with audience during “Led Boots” and coaxed them into signing the final stanza of “Over the Rainbow.” When a fan seated near the stage was caught recording the performance, Beck wagged his finger back and forth disapprovingly. Taking the stage in a black suit jacket and matching pants, Beck quickly shed the coat. His traditional attire of arms bare to the shoulders was almost like the magician’s disclaimer: nothing up my sleeves. But like a master illusionist, although Beck’s arsenal was on full display, it was impossible to figure out his tricks. On a fairly straightforward reading of “Over the Rainbow,” Beck played the melody barely moving his left hand on the neck of the guitar. The notes were altered by knobs and bars under his busy right hand. The Beatles needed a full orchestra for their “A Day in the Life.” Beck had everything he needed beyond his wrists. Tenderly plucking the first verse, he slowly built the song until the grand climax exploded off the stage. Over the course of the evening, Beck paid tribute to many of his favorite artists, including Jeff Buckley (“Corpus Christi Carol”), Muddy Waters (“Rollin’ and Tumblin’,” featuring White on vocals), Les Paul (“How High the Moon”), Jimi Hendrix (“Little Wing,” with Walden on the mic), Sly and the Family Stone (the lengthy raucous “I Want to Take You Higher”) and Puccini (set-closing “Nessun Dorma”). The styles may have been diverse, but Beck never sounded like anything other than himself. Setlist: Plan B; Stratus; Led Boots; Corpus Christi Carol; Hammerhead; Mna Na Eireann (Women of Ireland); bass solo; People Get Ready; You Never Know; Rollin’ and Tumblin’; Big Block; Over the Rainbow; Little Wing; Blast from the East; Two Rivers; Dirty Mind; drum solo; Brush With the Blues; A Day in the Life. Encore: I Want to Take You Higher; How High the Moon; Nessun Dorma. 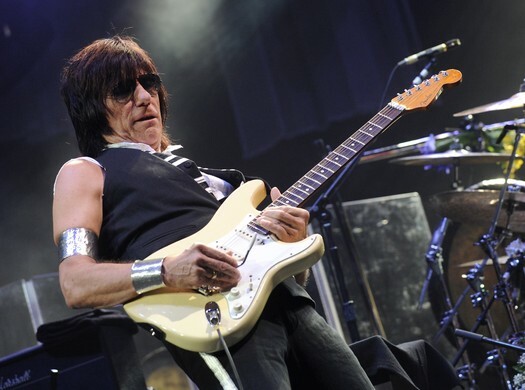 Guitar wizard Jeff Beck’s career spans six decades and encompasses rock, fusion, prog rock, rockabilly, techno and blues. So when Beck says he prefers to experiment in different styles, it’s a bit like Mick Jagger saying he likes groupies. The record includes performances with a full orchestra, collaborations with Irish, soul and opera singers and a pair of tributes to the late Jeff Buckley. “I try not to get stuck on something or I’ll end up doing four albums of the same thing. I dabble,” Beck said in a recent telephone interview while on tour in Australia. While Beck covers the gamut, his latest album was largely the product of good-luck accidents. Taking a cue from his fellow guitarists in the Yardbirds, Eric Clapton and Jimmy Page, Beck appears with an orchestra on several pieces, including Puccini’s aria “Nessun Dorma” and an arrangement of “Corpus Christi Carol,” recorded in tribute to Buckley. The initial result — an interpretation of Mahler’s Symphony No. 5 — remains unreleased, but it encouraged Beck to keep trying. Beck unintentionally mirrored another aspect of Clapton’s career when he covered “Over the Rainbow.” Clapton performed the number on his 2001 tour, but Beck said he has no intention of hearing Clapton’s interpretation “because I don’t want to realize any similarity. The lush orchestral numbers are countered by a pair of songs featuring Joss Stone on vocals, and several hard-rocking cuts with his old touring band, including young British bass savant Tal Wilkenfeld. On “Lilac Wine,” a second tribute to Buckley, Beck is joined by Imelda May on the mic. “Emotion and Commotion” closes with a song from the Oscar-winning score to “Atonement.” Beck had been working with an orchestra on the piece, when producer Steve Lipson told him opera singer Olivia Safe was recording next door. The tributes to Buckley were also serendipitous. Beck wasn’t familiar with the late singer-songwriter until someone slipped him a CD on the way out of a party. Beck said he was incredibly moved by Buckley’s singing and wanted to interpret that voice on the guitar. 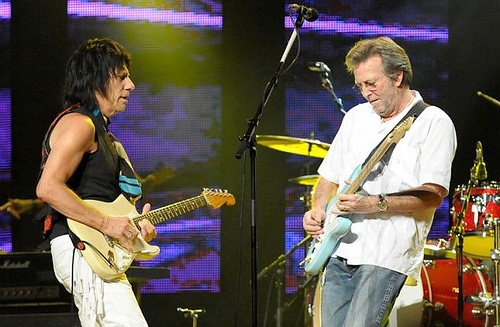 Before embarking on his latest tour, Beck paired with Clapton for a handful of dates in Japan. 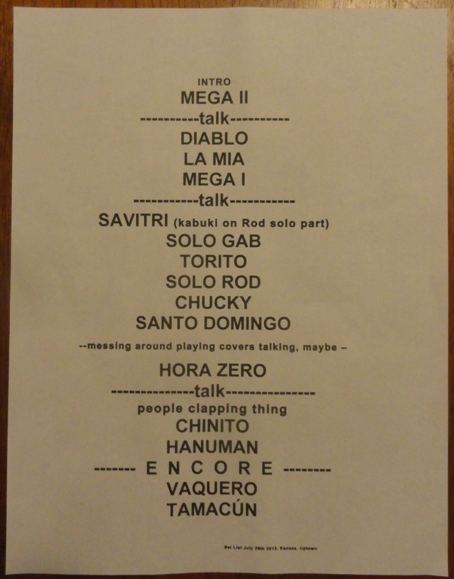 The shows featured solo sets from each guitarist and culminated with a jam. While Beck’s tour will include about half of the songs from “Emotion and Commotion,” it will feature none of the guest musicians, including Wilkenfeld. However, the tour has reunited Beck with drummer Narada Michael Walden, who played on Beck’s 1976 album “Wired.” Walden has since produced “The Bodyguard” soundtrack, wrote the No. 1 hit “Freeway of Love” for Aretha Franklin and has penned or produced other chart-toppers for Mariah Carey, Diana Ross, Starship and Al Jarreau.